Looking good, did you say this was at 34psi? can you re-post the sheet so the X line is in RPM rather than Km/h? 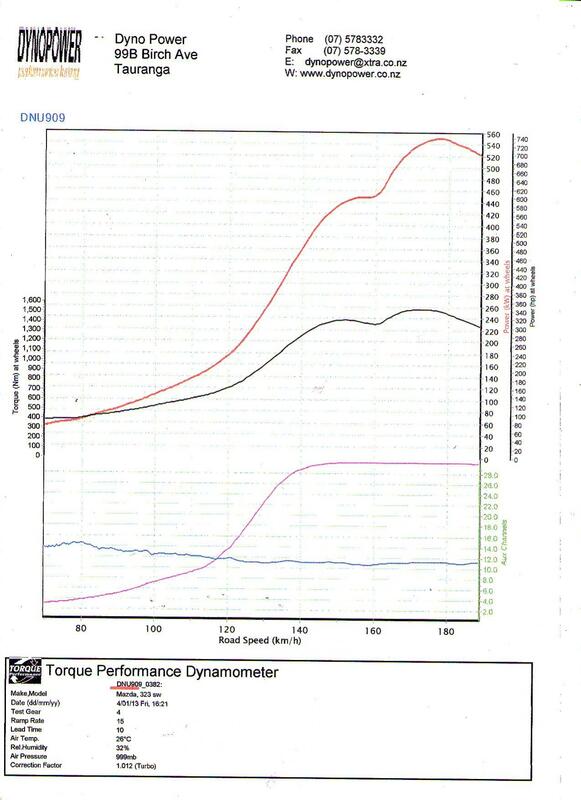 Howard, next time I'm at the dyno I'll see if I can print another sheet with rpm on it. To give you an idea the end of the run above was about 7500rpm from memory, instead of the 9000rpm we we're usually pulling to. Still street legal in full street trim, full exhaust, all glass, leaf springs, 26x8.5 tire, H pattern, and most importantly 93octane pump gas with water injection. Incredible thread. My little 60-1 only made 282 rwhp at 12 psi on the stock TII motor. What's your secret ingredient! So are the power gains from running WI pre turbo rather than right before the throttle body? There is no secret, just a combination that works. And a lot of dyno time. And remember i was running 29psi (dropping to 25psi) to make 520hp with the 60-1. Brian I don't know if there is any difference between pre and post turbo WI as I've only tried pre turbo. In theory both achieve the same end result (knock suppression), however it seems pre turbo can extend the compressor map somewhat when trying to get the most out of the turbo at higher boost levels. It also makes the turbo slightly laggier due to the increased mass the blades have to move, but this is more than offset by the compressor map extension and the simplicity of pre turbo vs post turbo. Lol... This thing at TX2k14!?!? JZG, is this the New Zealand Wagon run with the conjunction of Green Brothers? With an 80mm BW turbo fitted power jumped up some. 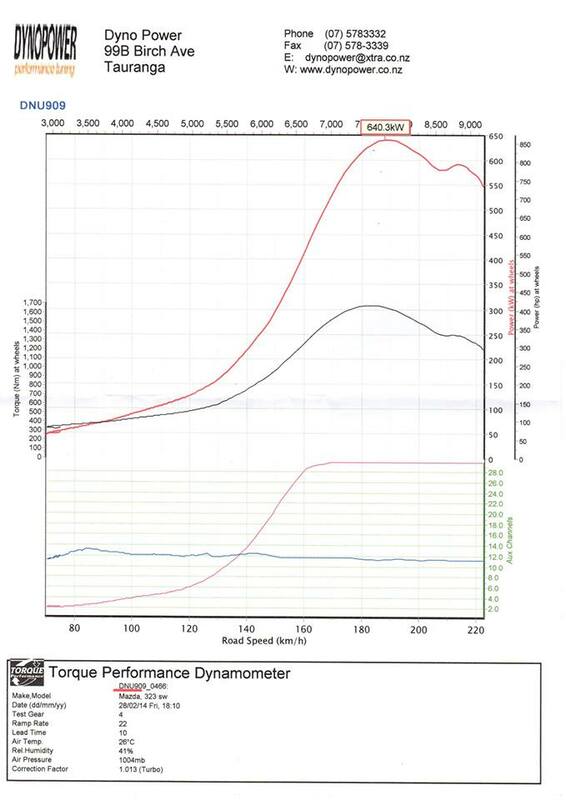 Dyno plot is at 40psi. The car has now trapped 161mph but only run slightly quicker in ET. It seems what it's gained in hp it's lost in 1/2 track performance, probably because it on 26x8.5's with leaf springs. With heavier wastegate springs I think the engine will take 45psi no problem. Pre turbo water injection is working better than I could have ever hoped for! BTW power drops away after peak torque because the tires start slipping on the roller at that point. In reality power doesn't start to drop until 9000rpm or so. Last edited by JZG; 03-04-14 at 02:57 AM. Thanks for posting all the good information. Are you still on 4 stock turboII trailing coils? Ever thought about removing the intercooler and increase the amount of water? We switched to IGN coils a while back, and are now testing an ICE ignition. I haven't considered removing the intercooler. Water injection amount is already high, and in my experience it doesn't really cool the intake charge much at all, even with a 50/50 mix of water and methanol. Removing the intercooler would save 35lbs though! Mentioned the no intercooler thing since you mentioned running e85. Posted some info in the Auxiliary fuel section. My DYI water system was not up to the task on a full out pass. Where the IGN coils a considerable improvement over the FC coils? I've been inspired by sleeper7, and plan on running FC coils on a direct fire setup. Sorry, forgot to mention I'm still running pump petrol. I never got around to trying E85 in the end. Yes the IGN coils seemed to be better, all things being equal. Hard to say how much of an improvement though because I went around in circles with different spark plugs as hp increased and ignition requirements changed. Thing is you have have to inject alot more of the total fluid to keep the knock down cause water alone does a much better job to keep the knock down compared to the same volume of 50/50, as I found out. I see. but from the other side methanol ads oxidizer which makes power.. how do you measure knock, or do you listen with a stethoscope? I don't know how many times this has been covered, but here we go again. Methanol or any alcohol is not an oxidiser. Consider it more as a fuel which has already been partially burned (or oxidised). It is the additional cool liquid mass of required fuel to match intake air mass which gives a power benefit over pump fuel, basically it is just additional evaporative cooling which increases air mass intake by ~10% nothing more, the extra oxygen is basically a passenger, not a reactant (it has aleady been "reduced" to a lower energy state). Cools intake charge, slower flame progression, cooler peak combustion temps. Think of methanol more as pump fuel with the water injection already mixed in. 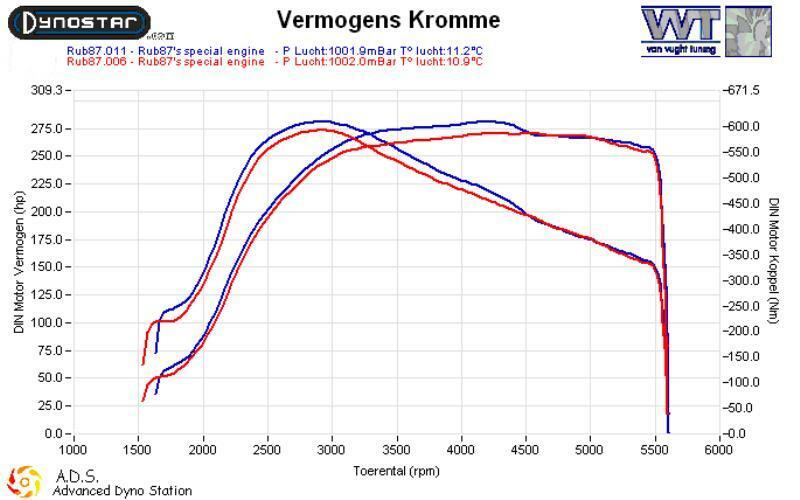 If he had reached the choke flow limit of the compressor it may give them a few % more mass air flow from charge cooling before the compressor if they put a big shot of meth in front of the turbo, but for a marginal gain it probably isn't worth it when you are dealing with turbos that big and no class restriction. If you wanted to get the most of that effect you would be better off using acetone as it has greater partial pressure for the same temperature anyway, or mix acetone/meth/ethanol for maximum effect. This observation seems contrary to what was presented in the often cited NACA studies, but an interesting observation nonetheless. Others, including myself, however, have noticed similar WI behavior to what you describe. ^^^Correct. I think there is considerable confusion regarding alcohol's reactions, possibly because of its classification as an Oxygenate when mixed with other fuels. That characterization is somewhat misleading because it doesn't release a bunch of free oxygen that is available for combustion. You'll need Nitro methane for that. If you want to leave the line on 15psi and run more in each gear, rather than fit a stiffer gate spring, why not use a 4 port boost solenoid and run boost per gear? I'm sure with the diaphragm area+spring force against even a rising EMP that you would have no worries pushing to 60psi boost on a 15psi spring with a 4 port solenoid which can pressurise the top chamber of the gate to hold it shut.